There are few places that are as extraordinarily beautiful under a thick, white veil of winter as Switzerland. Synonymous with mountains and cold-weather sports, Switzerland is a magnet for those seeking refinement and tradition, in addition to a rugged and majestic landscape. Epitomizing these attributes is the historical Swiss resort of St. Moritz, which is part of the prestigious Best of the Alps consortium. 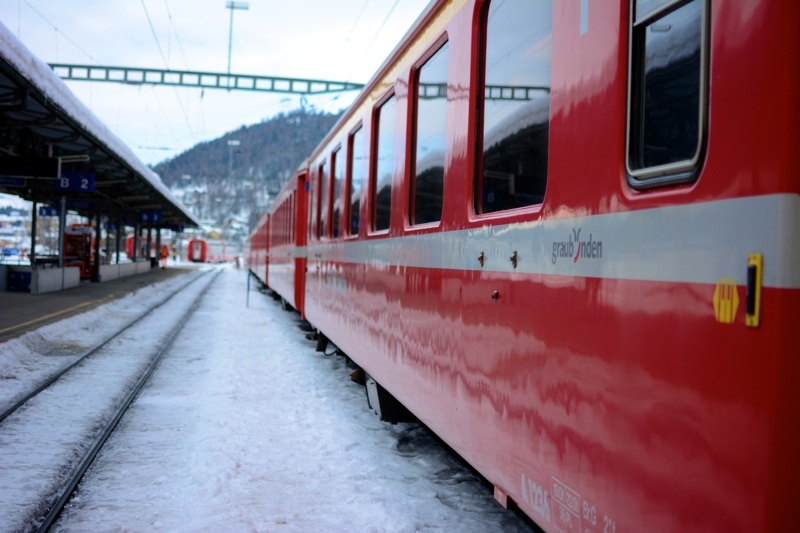 In the eastern portion of Switzerland known as Engadin, lies one of the most glamorous destinations, not only in the mountains, but the world. Dating to 1864, St. Moritz is also the world’s oldest winter resort. Already a popular summer draw, it was the promise of mild and sunny winters by hotelier, Johannes Badrutt, to four English guests that solidified St. Moritz as a winter holiday destination. True to Badrutt’s word, the English flocked to St. Moritz for its winter sunshine and dry, crystal-clear air. Today, the resort is most frequented by well heeled Swiss, Germans, Russians, Italians and British. St. Moritz solidified its international reputation as a world-class winter sport destination early in its history, which led to being awarded the 1928 and 1948 Olympic Winter Games. Home to the oldest bobsleigh run in the world, the Olympia Bob Run has been the location for twenty World Championships. And it was in St. Moritz that skeleton racing was invented on the legendary Cresta Run. 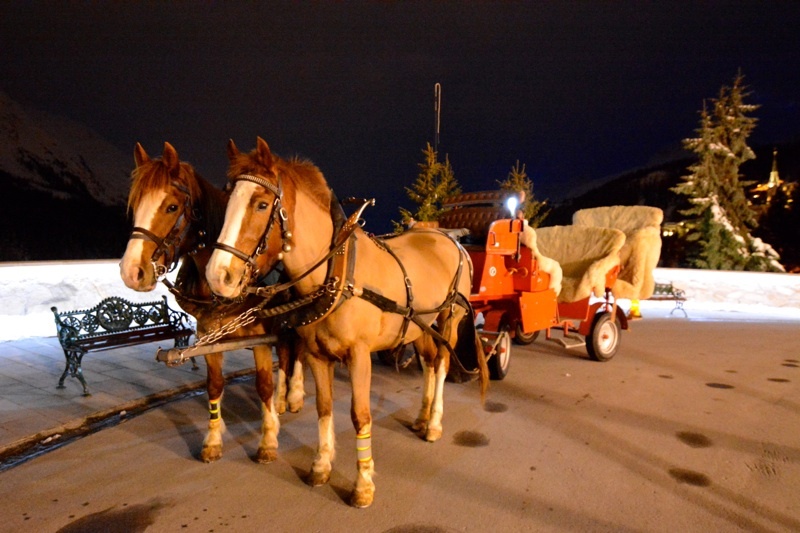 Since 1907, White Turf International Horse Races have taken place on frozen Lake St. Moritz. With harness and flat races, White Turf also features skijoring, where riderless thoroughbreds race around the track pulling brave skiers. Also on the lake are cricket and golf tournaments, as well as the St. Moritz Polo World Cup on Snow, which takes the oldest team sport in the world off grass and puts it onto ice. Having hosted the FIS Alpine World Ski Championships four times previously, St. Moritz will do so again in 2017, continuing its winter sports legacy. St. Moritz is home to Switzerland’s largest snow sport region, and by sitting at 5,906−10,837 feet above sea level, snow is all but guaranteed. 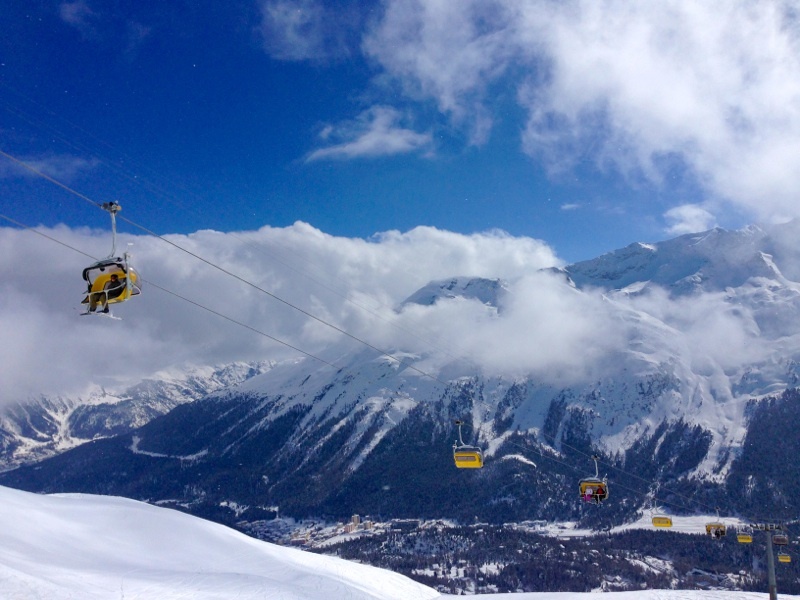 Combine plentiful snow with approximately 300 days of sunshine per year, and St. Moritz is the perfect playground for skiers and snowboarders alike. Divided across four main areas (Corviglia, Corvatsch, Diavolezza and Zuoz) are 88 runs covering 217 miles, ensuring variety for visitors. With 70% of its runs considered medium-level difficulty, St. Mortiz is ideal for the intermediate skier. Modern and efficient, the system of 56 lifts transport 65,000 passengers per hour, meaning more time on the slopes and less time queuing. Serious skiers will catch the first lift up at 7:45 a.m. for a run freshly-prepared White Carpet pistes. Downhill skiing isn’t the only activity sporty types enjoy in St. Moritz. There are 125 miles of cross-country ski trails in the area, including the 26-mile Marathon track, found between Maloja to Schanf. Speed junkies can take a turn on the world’s only natural-ice bobsleigh run. The one-mile track is completed in around 80 seconds. Snowkiting takes traditional windsurfing and puts it onto a frozen lake, enabling the rider to perform tricks with the help of wind power. Those wanting something less heart-attack-inducing will find miles of trails throughout the valleys, which are perfect for winter walking. High class at a high altitude is what visitors will find in St. Moritz. However, even with its reputation for catering to the most discriminating guests, St. Moritz hasn’t lost its Alpine charm. With its historical village and traditional horse-drawn sleighs, the fairytale atmosphere is still alive, though glistened up with presence of the world’s most recognizable luxury brands. Home to Europe’s highest-lying shopping street, Via Serlas, St. Moritz boasts brands such as Gucci, Louis Vuitton, Chanel, Bulgari, Roberto Cavalli and Prada, whose stores are designed to look like Swiss chalets, complete with open fireplaces. 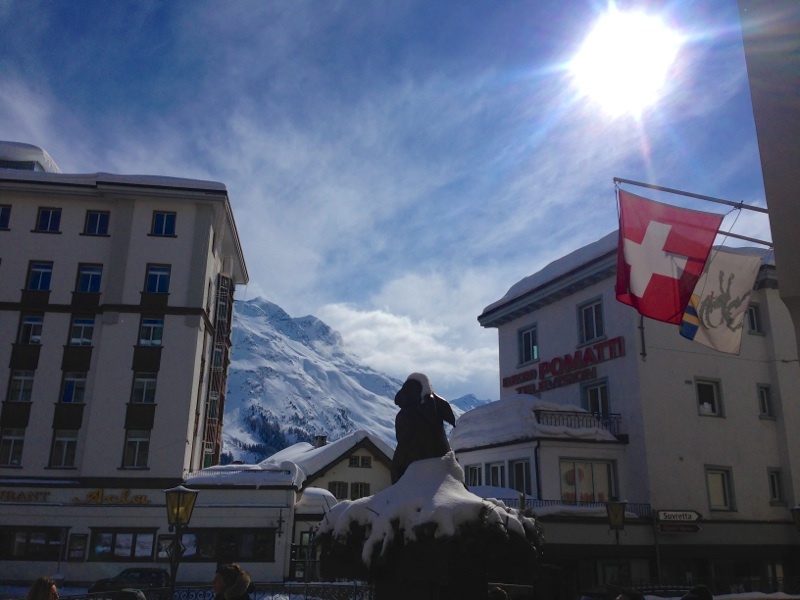 Obviously, shopping in St. Moritz is as much a sport as anything that occurs on the slopes. 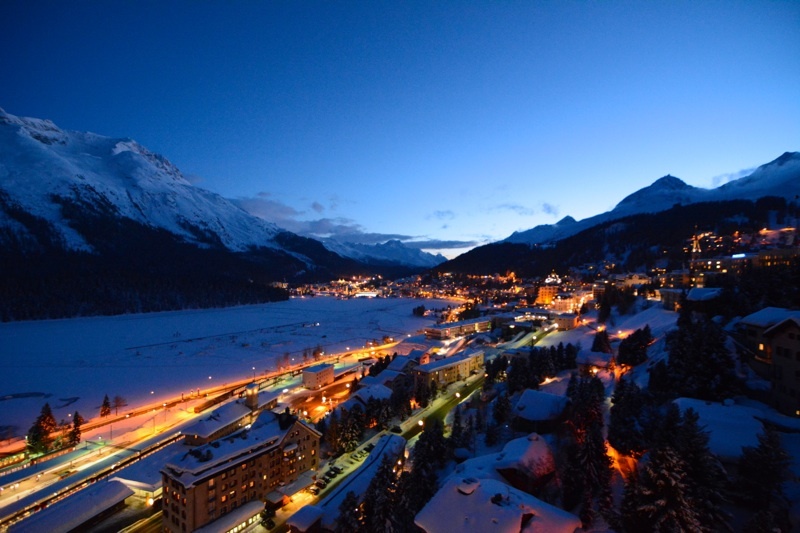 Home to five five-star superior hotels, St. Moritz features some of the finest accommodations in all of Europe. 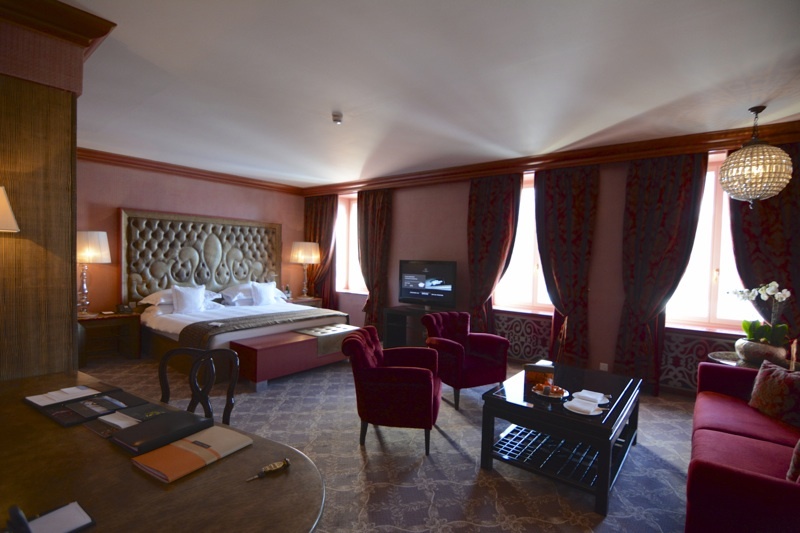 Formerly known as Pension Faller, the Klum Hotel St. Moritz dates to 1856, and was the first luxury hotel in the Alps. 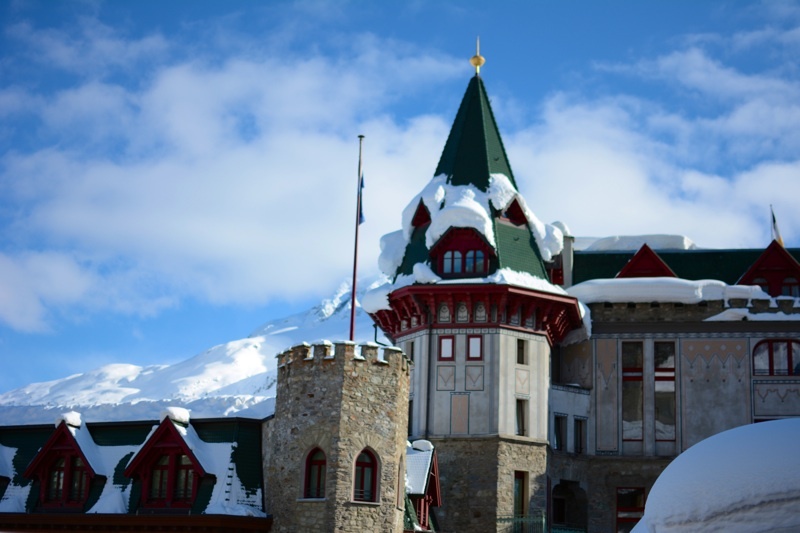 Opened in 1896, Badrutt’s Palace Hotel combines tradition and luxury in a spectacular setting. Recently celebrating its 100th anniversary, the Carlton Hotel is an impressive boutique hotel, located a short walk from the village center. During its 2007 restoration, state-of-the-art technology was melded with contemporary colors and design, while keeping the original exterior, stunning stairway, stone walls, fireplaces and decorative ceiling stucco work. With 60 suites all overlooking Lake St. Moritz, guests are afforded sweeping views across the valley. Guests also enjoy the nearly 13,000 square foot spa that spans three floors. 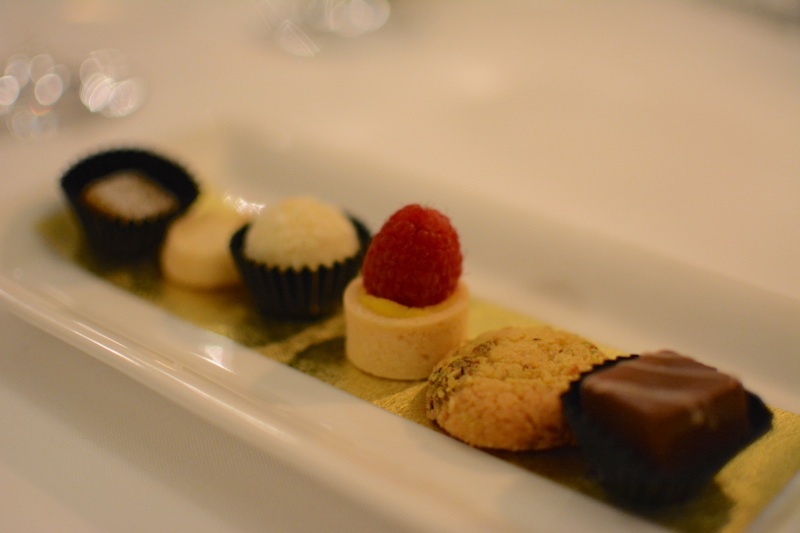 Epicureans are spoiled for choice in St. Moritz. With one out of ten restaurants holding a gourmet certificate, four Michelin-starred restaurants and 266 Gault Millau points, St. Moritz is gastronomically impressive. Annually, the Gourmet Festival showcases the area’s culinary talent, along with some of the top chefs from around the globe. At the Carlton Hotel, brothers Enrico and Roberto Carea bring their expertise (and three Michelin stars) from their Italian country estate to Restaurant Da Vittorio-St. Moritz during the winter season. 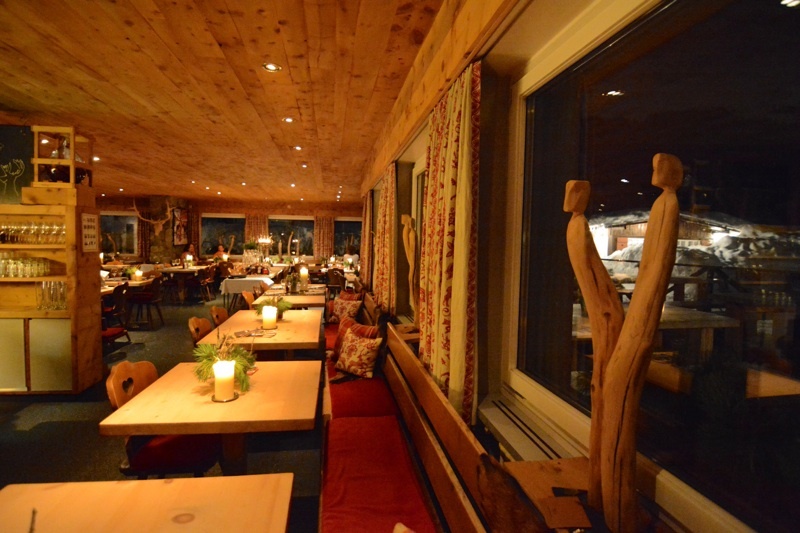 For typical regional dishes, Lej da Staz offers an elegantly rustic atmosphere, next to the picturesque Lake Staz in St. Moritz-Celerina. 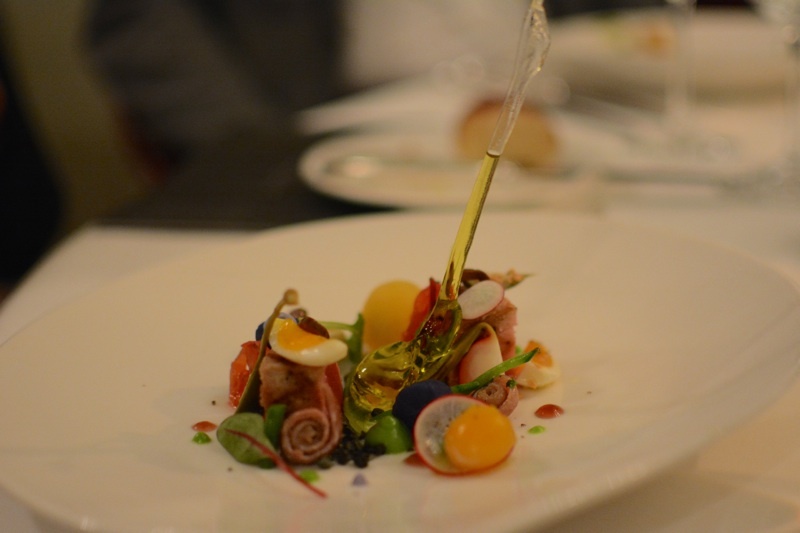 Fine food isn’t just relegated to the three surrounding villages that comprise St Moritz. 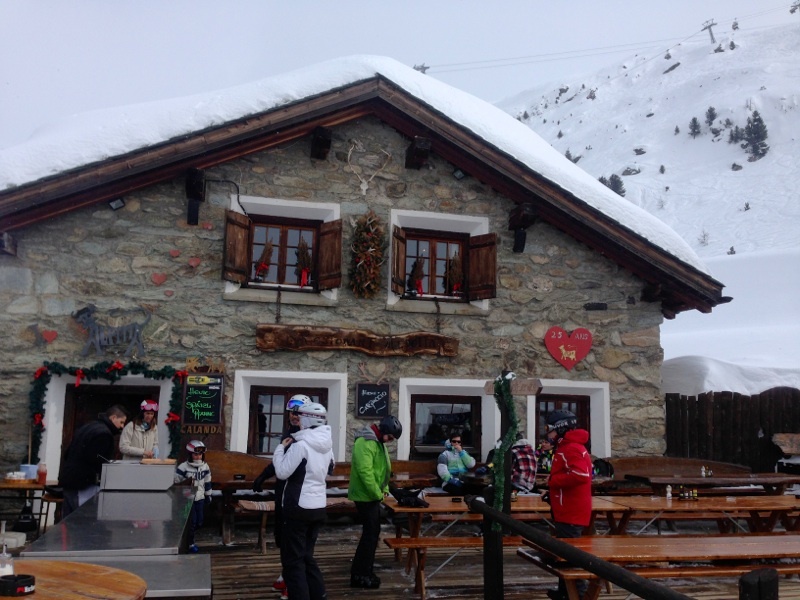 Located on the Chastelets slope and open for lunch, Restorant Alpetta serves area specialties of grilled meats, fondue and an impressive wine list in a traditional, cozy hut. It just over 8,000 feet above sea level is the Panorama restaurant in Muottas Muragl. With a 360-degree view, this restaurant specializes in fish, red meat, soups and pastas. Here, skiers can drink in the views and glasses of wine on the terrace at lunch, or enjoy the romantic atmosphere at dinner. Sitting at the top terminal on Corviglia at 8,156 feet above sea level is Mathis Food Affairs. With its seven gastronomic eateries, including the new Caviar House & Prunier Seafood Bar, the family-owned Mathis Food Affairs caters to skiers with discerning tastes. Perhaps the most posh place in the resort is the see-and-be-seen La Marmite. In its relaxed dining room, chef Reto Mathis personally shaves black truffles atop flammkuchen for his famished Fendi-clad patrons, and the only thing that rivals the view of Swiss mountains are his dishes of red deer, duck liver and ahi tuna. Variety is the spice of life for Devil’s Place, the bar found in Waldhaus am See. 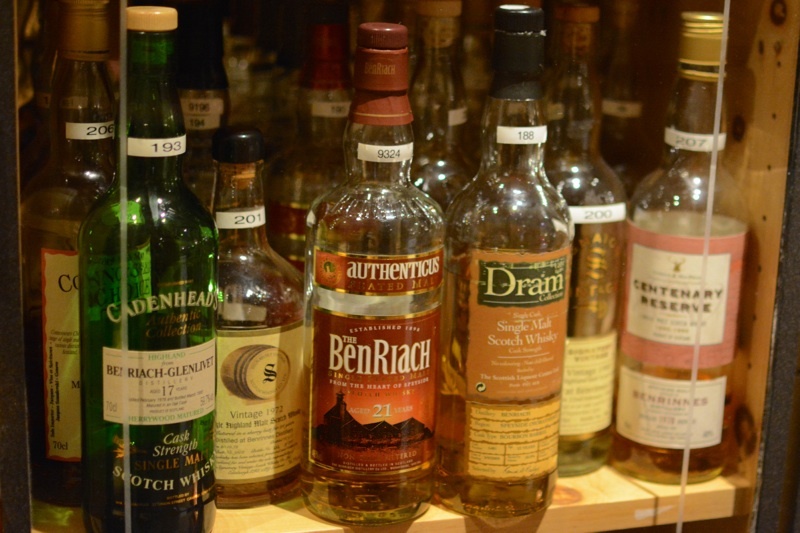 Devil’s Place has over 2,500 kinds of Scotch and holds the record for the largest selection in the world. Wine lovers won’t be disappointed in their 42-page menu that contains more than 1,300 wine listings. At Pavarotti & Friends in the center of St. Moritz, patrons not only enjoy extensive wine and Champagne offerings, but also impromptu arias from the owner and Pavarotti look-alike. For 150 years, St. Moritz has beckoned affluent cold-weather lovers for its idyllic location, weather and luxurious offerings. Today, that tradition continues in a way that would likely surpass Johannes Badrutt’s wildest expectations.